Let see I have been super busy trying to garden in humid weather which makes you feel a little droopy with sweat. Southern California is having some unusual super humid weather that gives you no energy. Yesterday my girlfriend and I went to Point Loma to get out of the heat.We had a great lunch of clams and watched this really huge seal begging away for fish. This California seal parked herself right next to the Point Loma fish market and knew a good spot to get handouts as she gazed up at the tourists and locals. Mama seal had a cute youngster and it was such a fun site to see the both of them. There were seagulls, fishing boats and people enjoying the hot day .What a relaxing site Point Loma is.The seals enjoy the marina because the fishing boats come and go with bait and the people are glad to see some ocean life . Years ago I went into an antique store and found a wonderful Pig hooked rug. It is what sparked my interest in rug hooking. Well there was another rug from Lancaster Pa. By Annie Lapp and Bev bought that one so it always makes me laugh how many coincidence's there are of friends and people you meet. I visited Bev on Tuesday and had such a fun time with her and Janet. I loved hearing about her life and how many interesting experiences she had in her lifetime. Beverly even worked at Yellowstone Park as a young woman.The tall white shutters open to her great view of the lake. Gazing away I was surprised to see an Osprey flying by.I left her some bulbs and a promise for a mint plant to add to her balcony.What a fun time with friends. because I have it hanging on a cupboard to take a picture. Egg and I Road Primitive Rug Done maybe? Well I finished the hooking today but I need to sit on the colors of the letters I still can't make up my mind if I like the crazy blue.One thing the letters and colors are not as bright as they look on my blog even one of my rug hooking friends Michele mentioned that to me. My Primitive Rug hooking lettering I don't like this part! Well I am on my final lap.Maybe it's me but the lettering is hard for me to do.I keep having to stop rehook and put my rug on hubby's easy chair to see if I can understand what the lettering is saying . It's suppose to say Egg and I Road. The colors are not as bright as they look on the camera. Every time I move the rug around some of it gets unhooked by the grippers on my frame has anyone ever had this happen? This primitive rug is about Washington and the colors of the homes and nature was so intense and so these colors seemed right for this rug. I am hoping all the hooking will be done by this weekend. Wish me luck! I hate to complain but I just don't know what to think of my fellow San Diegan's. San Diego is a beautiful place to live! How many times have I bragged about how great a place it is to visit. 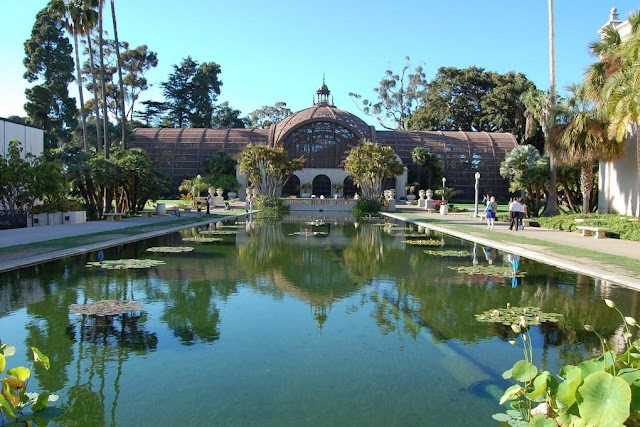 We have the San Diego Zoo, Sea World the beautiful beaches, the mountain town of Julian ,Laguna mountains and right in the middle of San Diego is the Lily and Koi pond in Balboa Park which is filled with large lily's and Koi fish .It's so pretty! As a child we would walk by it as we went from museum to museum in beautiful Balboa Park. 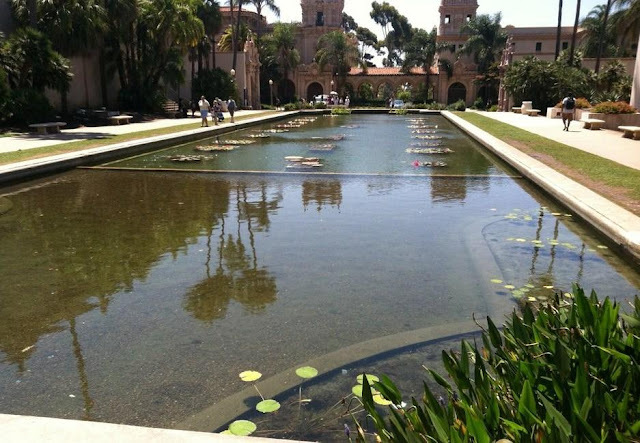 The Koi pond is an actual historic landmark and one of the treasures of Balboa Park. partygoers and some real thoughtless people about 1500 of them had a squirt gun fight at midnight and broke the pumps of the pond and practically drained the large pond. This is a beautiful Lily pond. People tramped all over the plants vandalizing the pond and terrorizing the Koi. It's quite sad when I think of those beautiful fish fighting to stay alive as the water drained down.I am not sure how many died but they destroyed most of the lily's.The next morning authorities discovered what had happened during the night. It's too bad no one called the police! How it looks after replacing the damage and pumps.It looks empty. Balboa Parks Koi and Lily Pond a landmark on a happier day. Then on the way to visit my Uncle with my cousin and my aunt there was a freeway fire going up a hillside.By the time we got close to the fire it was white smoke so it was under control. I wish I had taken pictures of all the cars everywhere.It was crazy! I grabbed my cousins phone to take some pictures but I realized how little I caught of the action. So picture this three freeways merge near the fire and were stuck with cars stopped in the three freeway ramps like a scene from a bad highway back up and of course were driving towards the fire . No car is moving and the additional firetrucks can't get to the fire. So one of the firemen jumps out and literally he is going car to car running and pointing and telling people where to move their cars.Some people are just oblivious to the firetrucks behind them ignoring them since they don't know where to go.I wanted so badly for the firemen to blow their horns or something.I have never seen firetrucks stuck in traffic in my life and dumb drivers making it hard to get by.I wonder maybe it's the heat in California and Oh yes we have three or four large wildfires going in the back country. My cousin was driving and so I was able to take a couple of pictures. It was a lot bigger but I couldn't get a good shot of the hillside. walking around visiting museums and the Koi pond. I also think some drivers need to remember to move over to the right when emergency vehicles are trying to get by. We did finish the day on a high note as we ate some wonderful yogurt at Jamba Juice. Hopefully this weekend I will finish my hooked rug. In mid April of this year my daughter Megan took me to sock camp at Port Ludlow Washington for my birthday. It was a great experience and one of the highlights was a whale watching trip out of Port Ludlow near Whidbey Island.It was such a beautiful day! I got so engrossed in watching the whales none of my pictures of the whales turned out.Last night Megan sent some of her pictures from our day Whale Watching. It's a refreshing set of pictures to see especially in this hot weather.. Be sure and click the picture for a slide show! The whale was between our boat and the sailboat . Cat days of Summer/My hooked rug goes pop! next to my front gate. They just stared at me too hot to move. I almost stepped on them they blended in so well.I guess they were just trying to get some cool shade but it just feels humid and hot! In the middle of this heat wave I hurt my back it even hurt to sit or walk. My back had been hurting too much so I had been laying on my side and waiting for it to get better. So finally it started to feel better this week. Poor Morris our orange tabby looks like he is sick of this weather and refusing to go outside during the day. Super Ants have discovered my kitchen and are not leaving without a fight.Hubby had to go on the roof and spray and yet here they are here once again. My dear friend in Missouri had told me about her fight with ants and I guess those California ants decided to show up Missouri ants and yep their hard to get rid of. Sunday we visited toddler Jack and he made us all laugh . He has a room full of toys but he loves his books. The whole time we were there he had a book in his hand only trouble occasionally he wants to nibble on the hard cover. Do you ever feel when your hooking away on a rug when something takes control of your hook and your going in a totally different direction. I love primitive rugs and I love dark colors but there is a part of me that just wants to pop out and it happened again. I put this crazy color in my rug for some crazy reason I liked it. I normally want my rugs to look old but that hook took control and there it was in my rug.My rug hooking friends were quietly looking at my rug not knowing what to think.My thought is when this rug fades a hundred years from now somebody will say wow what a pretty color.I just have to wait for the hundred years to pass. I still think did I do that? You all have heard how a rug should have a color that makes the rug Pop,hummmm..well I threw a firecracker in my rug. Lately I have been reading about antique rug making and part of it is doing something different so I know it’s weird but I am experimenting and I do like it. Even though I keep questioning the color it looks good from a distance.Sometimes I think I have to step out of my primitive comfort zone. I know what colors I should have used but there it is my inner Cheri is bright. Blame it on sock camp and the Pacific Northwest I just love those vibrant colors. The rug is about the Pacific Northwest trip so I think that’s why the rug wants Color in it, Weird I wonder if a hooked rug can have a choice in where it’s leading you? Maulie is getting all her hair cut off. Too hot for long hair. Maulie will be happy to be a little bald shitzu.